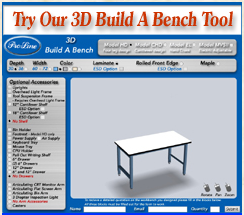 Use our interactive tool to build your bench today. Browse through some of our previous orders here. The driving force behind Williamson Honda’s move to a new space in September of 2005 was the opportunity to consolidate its operations into one beautiful, 75,000- square-foot facility. For over 60 years, the Lincoln, Nebraska car dealership had been based in the downtown section of the city, with growth forcing operations to spread out over a couple blocks into a few different buildings. The new facility on the outskirts of town would allow this family-run business to function more like one close-knit family, and service all its customers from one location. Williamson Honda’s move presented many exciting opportunities for the company, not the least of which was the chance to upgrade the equipment in its service department. The expansion of the department would allow the dealership to more than double its service stalls, from 22 to 49. This new layout, while a much-needed upgrade, also accentuated the department’s need for new workbenches. The need was, to say the least, urgent. This department featured a scattershot variety of old steel-top benches, some with one uncovered shelf beneath the worksurface. Sporting a variety of mismatched colors, these workbenches were not visually pleasing, and certainly did not come close to complementing the dealership’s quality image. “ We were starting fresh,” said John Randall, co-service manager at Williamson Honda. “We were moving out of a building that had been originally designed for other uses. The service area was cluttered and poorly laid out. We now had a space that was actually designed to be a service department. We had more space for each technician to work, room between hoists to roll out equipment, in-ground hoists, and minimal equipment on the walls. Williamson Honda began its selection process by trying out some prototype Proline ECB benches with butcher block work surfaces. Randall and his team liked the sample bench but opted to go for the sleek good looks of stainless steel tops. For added support and to accommodate vice grips, Proline custom configured the worksurfaces to feature a thick piece of particle board under the stainless steel. Randall explained, “The benches have steel girders that provide excellent support, but the benchtops themselves need to be able to handle some extremely heavy automotive parts, such as transmissions and rear differentials. Plus our technicians would be pounding, hammering and drilling. 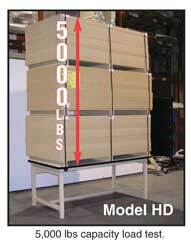 The extra support provided by the particle board would keep equipment and parts from bouncing or shaking. The department ordered 41 ECB benches from Proline, one for every stall that features a hoist. All of the benches were ordered with caster wheel accessories for maximum mobility. Built on Proline’s Model HD frame which has been in use since 1979, the ECB allows Williamson’s service technicians to store and secure items on two shelves behind sliding, secure, lockable doors. What’s more, the modular design of the ECB provides for future flexibility, allowing accessories such as lights and utility strips to be added in the future. Aesthetics was in fact deemed to be an essential aspect of the new service department. Clearly visible to customers, the space needed to instill confidence with a highly professional look and sleek design. The Proline workbenches were instrumental in this regard, not only with the consistent, attractive look of blue paint and stainless steel but also with their hidden, below-the-work surface storage. With each workbench featuring two shelves behind sliding doors, items that might have filled open bins and spilled over into the workspace were now safely stored below the surface. These include spare parts, nuts, bolts, tools, battery chargers, fans and other frequently used equipment and parts. Overall, Randall is extremely pleased with his new service department layout, and the Proline ECB workbenches in particular. He concluded, “With their mobility, nice work height and layout, and accessible storage, the Proline workbenches have definitely played a role in improving our workflow.